A reader who live in UK ask me how to use Chinese website to watch England Premier League, because that Chinese site play live game but only for Chinese IP users. I thought maybe we can use some Chinese proxy IPs, after several times testing this way seems failure, because only a few Chinese proxy IPs can pass test but speed is very slow. How can I do? I thought maybe I can use Tor Network to browse Chinese site, yes I did. Just like use Tor Network to watch BBC iPlayer video, same way but must change to Chinese nodes. It works, only problem is Chinese nodes seems offer slow speed, so if you watch online video it is probably unstable, picture like delay. So I try to find a free public Chinese VPN service. Actually, you can find many free public Chinese VPN servers but most servers are temporary, only for testing or play online game. 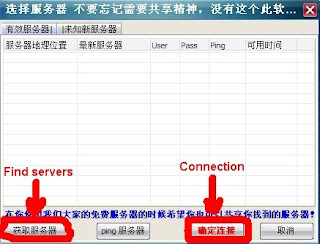 Yesterday, I found a small Chinese software that can test VPN servers and automatic connect to it for you. 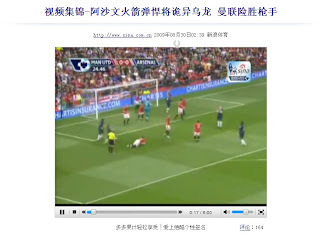 Today, I like to show you how to use this software to watch England Premier League on Chinese website. This software called "Feiyi-VPN", the main task is search available free public VPN servers, if it found them it will display some information like host, user ID, password, ping, and available time on the window. You can pick one to connect server, just one click it can do that job automatically. After done, you can go to this Chinese page to watch England Premier League. I did not test live game but I did watch some soccer game videos on this site, if you are not Chinese IP user you can not play them either. I also did speed testing, from VPN server to any site the speed is very good in China, but from China to other country it seems slow. I can watch video but sometimes pictures had delay. Speed test, from Chinese server to Manchester, UK. Well, let me show you how to use this software, because it is only Chinese version. 1, Download Feiyi VPN, I put it on box.net. If you prefer download file from official site just click here, or go to this Chinese website. It is a freeware. 2, Install and run it. 3, You can see a main window below. 4, Click "Choose share servers" button. 5, It will open another window, click "Find servers" button. 6, If everything is OK you can see some available servers on the window. 7, Pick a Chinese server (must pick "always free"). Do not pick a server which is outside of China. Click "Connection" button, it will automatic connect server for you. 8, If connection successful your system tray will display a small icon, the connection icon will be flashing. If you go to Start -> Control Panel -> Network Connections on your computer, you will see this icon there. Feiyi VPN setup automatically, if you exit client it also deleted by itself. Now, you can go to that Chinese site to watch England Premier League. Enjoying! P.S Most free public VPN servers have limited users and time, if they are full you can not connect to server but you can switch to another one. 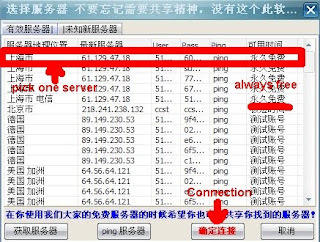 Most important point: Chinese VPN servers Are Nothelp you surf internet anonymously, it records and tracks your online behavior, they are only for browse Chinese websites or play online game. Update 09/27/09: Feiyi VPN newest version is 1.8.1, I had upload it into Box.net, it automatically update on same download page. What is difference between download official site and my site (box.net)? I deleted some junk files that is not for non Chinese users. 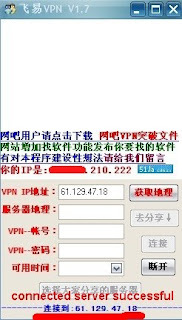 Update 2: You can use another Chinese software - 173VPN. Update 3: You can use an English VPN dial-up to watch online sport games. Update 4: Feiyi-VPN is upgrade, it changed interface, so I think it is not good for non-Chinese users anymore.